Now that I have thrown all standards out the window, I am finding this blogging business to be far easier and more enjoyable than my previous attempts. I have so many things to say, I could post multiple times a day – only I’d have avoid sleeping, eating and other necessary actions. So it was with a heavy heart that I had to choose from among my many pictures of adorable animals. The blogging tempo is what decided it, and I am already far behind any reasonable time frame for claiming inspiration from Interesting Literature‘s post, Nine Unusual Author Deaths. That was posted over a month ago, which in internet time, approximately seven times dog years, is over two years ago. Interesting Literature actually notes that quite a few of these bizarre deaths are not believed to be true. However, I’m inclined to believe the story about Aeschylus dying after having a turtle fall on his head because I once had a frog fall on me. Fortunately, frogs have soft squishy bodies and I emerged from this near death experience quite unscathed. I had some vague recollection that according to the Christian holy book that there was supposed to be something bad about frogs falling from the sky and I braced for Armegeddon. Then I took a picture. 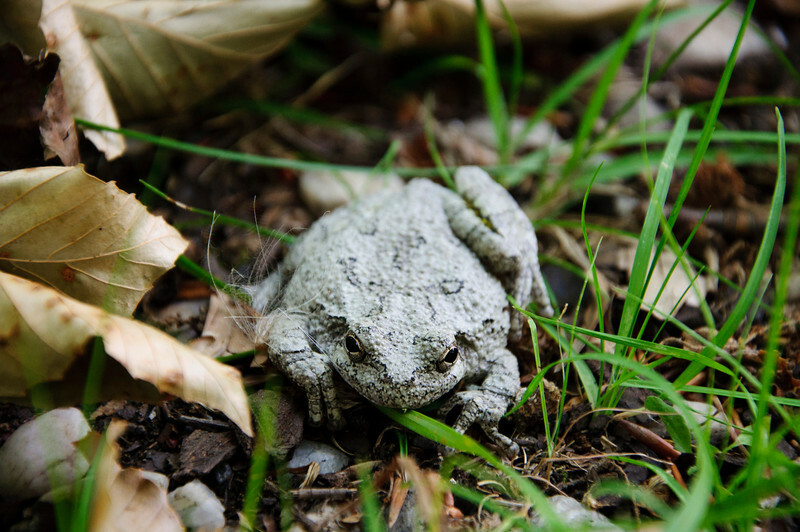 Voilà – adorable cuddle gray tree frog. And the frog is nice too. Nice to know you are finding so many things to blog about. We never know where our next motivation/inspiration might come from.